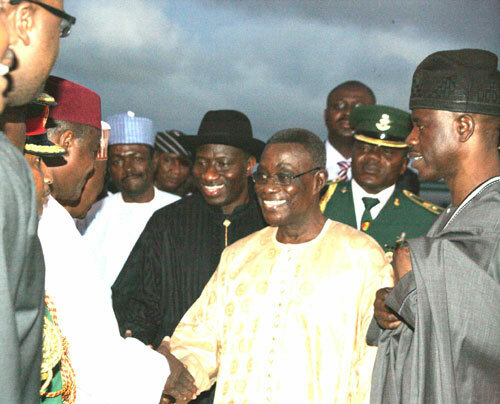 “Nigeria’s independence anniversary in 2012 and 2013 would not be different from the low key celebration of Nigeria’s 51st independence anniversary last Saturday, October 1, just as the 2014 independence anniversary would be merged with centenary celebration to mark 100 years of amalgamation at the twilight of his administration on May 2015. “The Government had insisted that the low key celebration was to cut cost having spent huge amount of money on Nigeria’s 50th independence anniversary celebration as well as the inauguration ceremony of the President and Governors of the 36 States in less than one year.” - President Jonathan. I'm waiting for him to start selling petrol at =N=142.50 in January 2012. Its then he'll realise that Nigerians are no fools and will not be taken for a ride anymore. People are barely making ends meet and he wants to inflict more hardship!! As for Okonjo Iweala and her IMF script to ensure the naira is devalued to the rate of 200 dollars to one naira, e nor go beta for you lailai!